Tweet of the Week: 1,000-Point Reservations Help You Earn Free Meals Faster! Do you love Dining Rewards Points like Lisa Gartland does? Then, take a lesson from her and start booking 1,000-point restaurant reservations on OpenTable! Available at a select set of restaurants during specific time frames, bonus-point reservations can be booked using the special 1,000-point links that appear on our website! And, they help you earn free meals, via OpenTable Dining Cheques, faster! 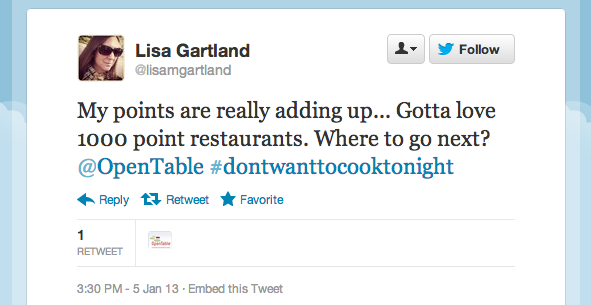 Thanks for the tweet, @lisamgartland — and enjoy your next Dining Cheque.